I am officially hitting the six month mark this week!!!! Now, I don't know where that falls on the "9 months of pregnancy" which is really closer to 10 months. I've learned there are so many ways to view this. I prefer counting down the weeks. Baby is still the adorable little papaya this week from head to rump. Not much has changed. I've had some more bouts of nausea here and there. The bladder is starting to give it a rest though. I'm actually only having to go once or twice during the night. I've also started experiencing small terms of insomnia. At this stage in pregnancy, energy seems to be coming in waves for me. Most nights, I get one between 3-4am. I find myself thinking of everything under the sun until I send myself into full panic mode about money, Greg, Greg's business, my job, labor and deliver, nursery decorating (or lack there of), etc. I wind up berating myself hours later for not demanding my brain to shut down and find myself dragging through the days. Hopefully this ends soon! The soreness in my back has kicked it up a notch and I suspect its due to the almost constant ache in my ribs. I can tell my rib cage has expanded greatly for several reasons I won't go into. Lets just say that my huge and sacky sleep shirts are even getting a little too snug around the ribs, in addition to other places. 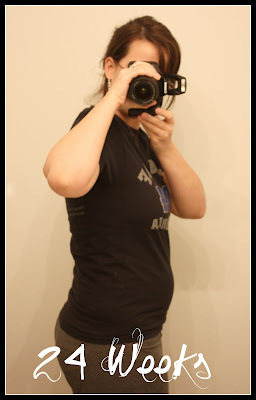 Week 23 found me floored that I could still get a pair of pre-preg jeans zipped and buttoned comfortably. Week 23.75 found me floored that I could no longer zip or button those same pre-preg jeans. Something happened in those 3 or 4 days and I expanded very quickly. I am still constantly hearing that I am "so lucky" or finding that people don't believe I can have hit the 6 month mark already. I've been told to brace myself for a massive expansion that will occur sometime in the next month. Apparently, its shockingly quick for women that take so long to start showing. I have this honey-do list my dear honey is attempting to get done little by little. Its really not that big but we have a lot of misplaced furniture that allows no room for babies, bassinets, or nurseries. My first goal was to get the nursery emptied out before baby stuff started coming in. Well, now we have the crib and the dresser is on its way and we only just got the old bed carried to the basement tonight. 1 box checked, 13 more to go! Here's to hoping! I've been promised it will all be done by mid-week. After that comes painting and sewing and cleaning and more painting and organizing. This must be done in time for the baby showers! The first one is in 7 weeks! With a full work load, a house, husband and dogs to take care of, that is not much time. Well, that's it for week 24; eggplant, insomnia, less-frequent urination, rib pains, weight panic and many things to do.